Between the Lines: Dora's Ballet Adventures Giveaway! D-D-D-D-D-Dora! D-D-D-D-D-Dora! Dora, Dora, Dora the Explorer! Sound familiar? No???? Well, where have you been?!? Dora the Explorer has been delighting and teaching kids for years with her fun and exciting adventures. Along with her friend Boots the Monkey and her trusty Backpack and Map, Dora explores the world around her while practicing her colors, shapes, rhyming words, and much more. And all the while, she helps our children learn basic Spanish words and gets them on their feet to sing and dance. Children love to help Dora and her friends reach their goal and parents love that each episode requires participation and activity from their young ones. Dora the Explorer: Dora’s Ballet Adventures, created by Nickelodeon Home Entertainment and distributed by Paramount Home Entertainment, is now available on DVD nationwide! 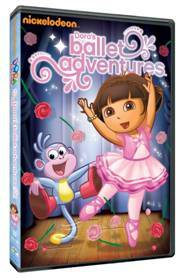 Join Dora as she gets ready for her big dance show in this compilation DVD which features four of her dancing episodes. Help Dora find her ballet shoes in Dora’s Ballet Adventures, take part in the musical parade in Dora, La Músico, join the party in The Super Silly Fiesta and celebrate Boots’ birthday in Surprise! Dora’s dance class is getting ready for a special dance recital and her whole family’s there to watch her perform. They just need to wait for the Delivery Duck to deliver their ballet slippers. But the Delivery Duck brings scuba flippers instead of ballet slippers! Dora and Boots must get the slippers before the recital begins. C’mon and join the musical parade! Dora and Boots are leading a parranda over the Piano Bridge and through the Singing Gate to free the instruments that were locked up by the evil Señor Shhh! Dora and Boots are invited to the Big Red Chicken’s Super Silly Fiesta where there will be silly snacks, silly games, silly hats and even silly dancing. But, the Big Red Chicken lost his party cake! Dora and Boots set off to save the fiesta. After searching forever, they find the cake in the silliest place Big Red Chicken could have left it – on his head! It’s Boots’ birthday! Dora tells him that all of his friends are waiting at her house to give Boots a big party. To reach Dora’s house, they’ll have to climb a long flight of Stairs and cross the Troll Bridge. Buy it: Buy your favorite Dora DVD's at the Nick Store! Win it: Visit the Nick Store and let me know which DVD your little one would love to have. Please remember to include your email address so that I can contact you in case you are the winner. Giveaway open to US and Canada only. Winner will be chosen randomly. An email notification will be sent to the email address provided by the winner. The winner must respond within 48 hours. Failure to do so will result in being disqualified and a new winner will be chosen. Disclaimer: . The opinions & thoughts expressed are my own. I received no compensation in exchange for this post Prizes are mailed out by the distributor and Between the Lines cannot be held accountable for prizes not sent. I am a follower to between the lions and also nick jr. I have a two year old that is crazy about Dora and she would just love to win this. Very cute. My daughter just adores Dora and everything Dora. I haven't gotten the chance to see what this DVD is all about. Thanks for sharing your opinion about it. She'd love any of the Dora dvds. I think one she would really like is Dora the Explorer - Dora's First Trip. My granddaughter would love to have the Yo Gabba Gabba! : The Dancey Dance Bunch DVD.